We all have experiences with our best friend's, in my case a 2 year old border collie, "guilty" look. Zephy usually jumps through the air because she is excited to see me, which is the case most of the time. But when she starts to walk like a very cautious cat, trying to blend in with my furniture, we both know something is up. 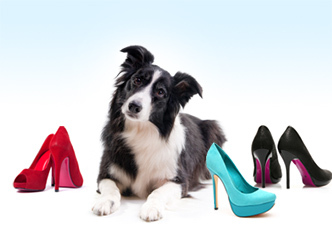 As in every regular dog family, there are usually one or two shoes involved. I have gotten better about not leaving my shoes unattended, but occasionally I still end up sharing them with my dog. Somehow Zephy knows exactly which are my most favorite shoes, and, as I learned quickly - the most expensive ones or even impossible to replace. Zephy has good taste and targets extra tasty, all-leather shoes. I took it for granted that I had those shoes. I am originally from Germany and grew up buying based on quality and durability, not solely based on fashion. So, most of my shoes were more than 10 years old, made from real leather, and still looked like new. As I tried to replace them, I quickly learned that shoes of that quality are a luxury item here in the United States and I was not willing to invest the going price. Not only were they expensive, they are also hard to find, especially since I am not someone who likes to shop in a mall. Instead I found myself flying back to Germany to find the perfect pair of shoes, which is not the best solution. And then I found Zappos.com. I must say Zappos has met all of my expectations. The shipping is great, service is quick, and I love the fact that I can bookmark my favorite shoes separately from those my husband prefers. Zappos as a brand has definitely earned my consumer trust and I have recommended them to friends. But still, there is something I feel they can do better. Do you have an idea of how many pairs of shoes Zappos sells? Take a guess. They offer a staggering 6,348,973 products in 153,871 styles from 1,393 brands! This is more than I can handle. I feel extremely frustrated when browsing the site, it feels like I am wasting my time. There are so many things I would rather be doing, like taking Zephy for a walk! A company offering that many products is obviously trying to appeal to a very broad customer base. Some customers like to browse, I don't. Some want to know what's new every single week. I only want to know what's new when I'm ready to buy new shoes. It is not that I can't decide what I want. I have a very clear idea of the style, quality and budget I prefer. Even though Zappos has a great selection of newsletters and notifications to choose from, the options I can choose - specials by certain brands or when certain shoes are back in stock - do not really meet my needs. When it comes to shoes, I am not a person who religiously sticks with a brand, even though I will remember good fitting shoes forever. Wouldn't it be wonderful if I could tell Zappos that I love all-leather shoes, that I am open to trying different brands and that I only want to know what's available on my timeframe? Instead of a weekly email with every offer, why can't I log into my account and tell them "send the email now"? Show me what you have today that you think I might like, because I am ready to buy. I know I am taking customized marketing to an extreme level with my request, but technology is here to make my life easier, isn't it? After all, even my dog is smart enough to know which are my favorites. What's in it for Zappos? Better targeted emails that customers pay attention to and appreciate, a reduction in disgruntled customers unsubscribing from emails, a higher click-through rate, and, in my case, a likely purchase. A win-win situation for both of us!